I thought the Detail King auto detailing training classes where very informative and I learned a lot about the business side of the detailing business. The hands on classes really cleared up a lot of the questions I had about compounding and polishing techniques. The procedures on how to properly detail a car should cut my detail times down considerably . Thank you to all the speakers and trainers who took the time to teach us. I recently attended the April 2 day training class. Gary. 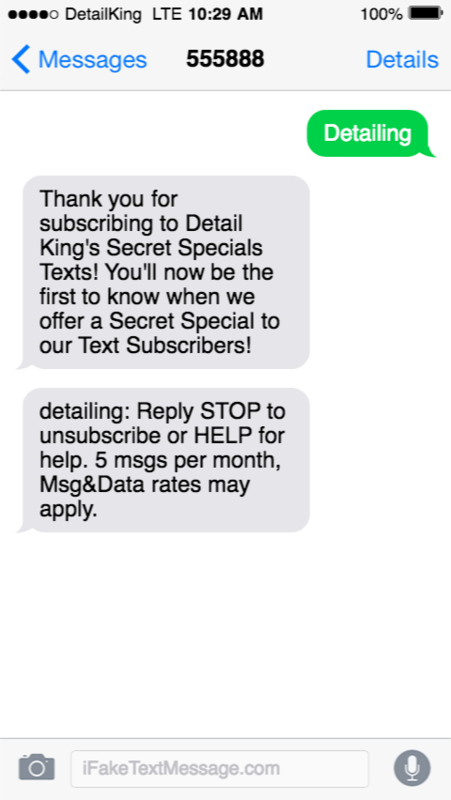 Subscribing to Detail King’s Secret Specials Text Alerts will get you EXCLUSIVE Specials and Promotions texted to you EVERY WEEK! Be a part of the King’s inner circle and reap the deals he dishes out!